A few days before May 9, the Commission on Elections (Comelec) reminded the public that taking a selfie with their ballot is an election offense. "They can bring their cellphones but they cannot use them inside the polling precincts," said Comelec Chairman Andres Bautista. So when the photos of ABS-CBN talents Kathryn Bernando and Daniel Padilla holding their ballots surfaced online, netizens reacted negatively. Moreover, the 20-year-old actress was also seen wearing a Daang Matuwid baller while voting. It was earlier pointed out that any material that bears a candidate's face, name, and logo is not allowed inside polling places. However, Comelec Commissioner Rowena Guazon told GMA Network that the duo, more popularly known as KathNiel, did not violate the secrecy of the ballots since they did not take the photo themselves. She explains: "Kung iba ang nag-picture sa kanya, obviously hindi siya kumuha sa sarili niya. Tingnan natin ang circumstances ha, baka kasi may iba pang facts pero sa ngayon...'yun lang nangyari bago bumoto gumanun (posed for a photo). It does not violate the secrecy of the ballot." Guanzon did not mention if reporters such as Gretchen Fullido, who allegedly took the controversial photos, are exempted from election law. While everyone's eyes were on the loveteam, another ABS-CBN actor posted a photo of his ballot on social media. 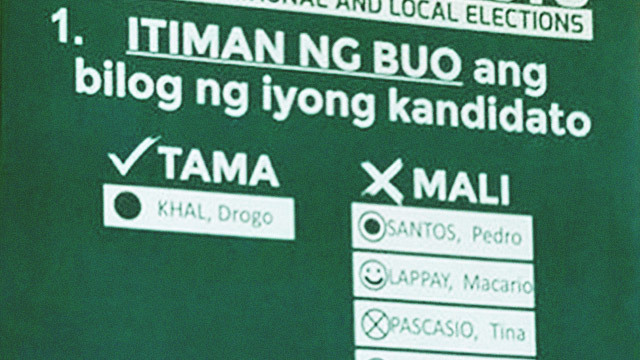 Robin Padilla, Daniel's uncle, shared his ballot photo on Instagram where it showed his votes for Davao City Mayor Rodrigo Duterte and the AMIN party-list. The caption that accompanied his photo read: "Kapag pinaglapas pa natin ang pagkakataon na ito at hindi natin iniluklok si Rodrigo Duterte bilang presidente, ang inaasahang nating pagbabago idudulot ng Federalismo ay mapupunta sa kawalan at mas lalong magpapatuloy ang senyorita at senyorita sa pang-aalipin sa ating yaman at kalayaan." The post was deleted minutes after it was posted but it was too late. Meanwhile, presidential candidate Mar Roxas is also under fire for showing his vote receipt to the media. Chairman Bautista earlier stated that voting receipts must be immediately dropped in designated receptacles. "The Supreme Court decision on voting receipts is clear," stated the Comelec official. "It is illegal to bring the receipts out of the precincts." On the other hand, Twitter user @MadameBernado posted a photo of This Time stars Nadine Lustre and James Reid with their "ballots." However, the papers JaDine were holding appeared to be their biometric registration slips. She later deleted her post. While other netizens were enraged by these photos, others decided to take things lightly by posting photos with their own "ballot."